I spent last week at COLCOA (City of Lights, City of Angels), otherwise known as the French Film Festival in Los Angeles held at the Director’s Guild in Hollywood. I go almost every year as my version of a staycation, combining the fun of seeing foreign films debuting in the US with Question &amp; Answer dialogues with the directors, writers, and actors. Of the six films I saw, my two favorites were “Haute Cuisine” (Saveurs du Palais) and “What’s in A Name” (Le Prénom). Best of all it’s only a 10 mile drive away and I always try new places to eat when I go. This year I found The Pikey. It was so good that throughout the week of the film festival, I went back four times! The word “Pikey” is slang for “traveler” as in the kind who are known for taking advantage of people, but in the case of this place, I would gladly volunteer to be used as a gastronomic guinea pig. Although it looks like an English pub from the outside, the food they serve here definitely has its roots in Los Angeles. Their ingredients are all locally or organically sourced, and all their meat is free range and cruelty free. The interior has a restaurant side and a bar side, but on most days the patio is a perfect spot to sit with the sunbrellas and heat lamps. Not wishing to compete with 700 people at COLCOA for the free continental breakfast, I parked and walked the four blocks to the Pikey from the DGA building and had brunch. Their Bloody Mary for $8 is made with Vegemite! Yes, you read that correctly, Vegemite! Yes, those are pickled green beans as garnish. Yes, it was delicious! I needed something more substantial than a $4 Crumpet with honeycomb and clotted cream for my movie marathon, so I ordered the cured Arctic Char with scrambled eggs in Hollandaise and biscuit for $14. This was probably the best brunch plate I have ever eaten. The eggs were done perfectly, not too runny, not overcooked, the cured Arctic Char was sublime, and the Hollandaise was perfect proportion to the eggs and cured fish. The biscuit was fluffy and flaky (a difficult combination to master), needing nothing on it, and the watercress salad had a fresh lemon dressing that balanced the rich eggs and biscuit. Writing about it now makes me wish it was the week-end now so I can go get this again! I went back after a show and ordered a dinner of the vegan eggplant, tomato and lentil curry served with Punjabi cornbread for $15, and the redolent spices of the curry made me smile with joy when it arrived on my table. I’m sorry to not have a picture for you, but it was dark and I did not want to disturb the other diners with a flash from my camera. On another day I came before a movie and had appetizers outside. Even though they are a “pub”, they serve great wines like Muscadet, wonderful scotches, and exotic liqueurs mixed in signature drinks with names like the “Twiggy” the “Guvnor” and the “Coach and Horses” for about $14. I ordered a glass of Entre Deux Mers White Bordeaux (yes, I can be boring at times). A white Bordeaux just tasted better with the Arctic Char Crudo with Sea Beans and California Citrus for $16. Both were delightful. The fish was amazingly fresh with a light citrus and olive oil dressing and the sea beans were slightly salty vegetables that resemble tiny asparagus. If you love sashimi this dish has your name on it. Every server and host I had on my four visits was exceptionally friendly and professional, and since I couldn’t decide whether I wanted curried cauliflower or the thrice cooked chips with Worcestershire aioli (both $6), I asked my waitress to decide for me. She wisely chose the chips since she said, “You’ve already been so healthy with the crudo”! The chips ($6) came with an assortment of sauces in case I did not like the Worcestershire aioli (it was good). They were so great simply plain (see, I told you I’m boring) that I nearly ate them all (although I did sprinkle some malt vinegar on them just to be traditionally British). On another afternoon I stopped in for the seared squid with curried chick peas for $13.The squid was absolutely tender and the curried chick peas had a nice smoky flavor. My only complaint about this plate was that there wasn’t more squid! The key to watching two movies in one day is staying awake for both of them, so I had a latte before I left and was surprised at how well they make their coffee drinks! I would come here for just coffee (it was that good). They offer valet parking in the evening, but depending on when you are going, you can find free parking in the back or on one of the side streets off Sunset Boulevard. Their menu says “Me Likey The Pikey”, and I couldn’t agree more! It’s always fun to have lunch with friends, and one of them suggested Ford’s Filling Station. I love the food at Tender Greens next door, and the recently opened LYFE across the street, so stopping at a new spot was a challenge when my reflex is to go to the tried and true. This was one of the original gastropubs in downtown Culver City, and it has managed to remain in business, so they must be doing something right. Personable service is one of the things they are doing right; from the moment I entered everyone made sure that I was comfortable waiting for the rest of my group to arrive. When everyone did arrive, we sat in the shaded and sheltered patio and asked our waiter for suggestions on the lunch menu. Since I heard that they source their pigs from the same place as Lindy &amp; Grundy, I knew the Bacon in the BLTA with roasted tomato, arugula and garlic aioli for $12 would be good. The bacon was great, unfortunately the aioli was basically just mayonnaise and the rest of the sandwich was not noteworthy with an excess of bun to filling ratio. The crab salad with watercress, spring citrus, avocado, and a Meyer lemon dressing for $14 vied for my choice of entrees. It was freshly prepared and a pleasant light meal. Two of us ordered the special of the day, the Grilled Steak Salad for $14. It arrived in a big wooden “trough” with butter lettuce, avocado (which seems to be a signature ingredient here), parmesan, and radishes. The steak was only offered medium rare and it was marinated in a chimichurri sauce, but it lacked flavor and seasoning and I found the entire salad rather bland. Sometimes trying a new place makes you appreciate old favorites and as I ate my steak salad I longingly looked next door at Tender Greens, wishing I was eating there where I could have ordered a flavorful rare steak salad. The drinks we had were great, one of us even got a shot of jalapeno infused tequila which she enjoyed, so if you are looking for a great place to have drinks and maybe a snack, like fried chick peas, taquitos, or bacon wrapped dates, this would be a good choice. Sycamore Kitchen is my Mid City alternative to Huckleberry in Santa Monica. Even the fact that the owners are married and she specializes in sweet baked goods and breads while he tends to the savory side of the menu are common themes! Their spectacular salads made me drive to them twice in one week for lunch! Even at 2pm, there was a line, so in less than a year people have already made this a favorite. With an enclosed patio and rustic/industrial interior, you have a choice of atmosphere if you manage to find a seat (there are communal tables which do not get filled as quickly). Another day, another salad, so the next time I came in I ordered the Vietnamese beef salad special for $15. Five spiced flank steak, cabbage, red peppers, chile, cilantro and peanuts in a soy lime vinaigrette made this a taste of a green Vietnam. Even though I HATE cilantro, I still loved this salad (I simply picked out the offending cilantro and left it in my bowl). The five spice was subtle, the beef was tender, the vinaigrette refreshing, and the medley of colors and flavors was exotic and complex. If this is available and you eat red meat, order it! I can not live on salads alone, so I took advantage of the short rib sandwich special for $13 on another visit. Made with onion stout jam, mushrooms, Swiss cheese and horseradish mayo, this was pure comfort in a sandwich. Served with a side salad of mixed greens, this tender concoction of meat could probably turn a vegetarian into a meat eater (maybe not, but it might at least tempt them). Since they are a bakery and are as well known for their baked goods as their meals, I had to at least try a few sweet treats. The Lemon Polenta pound cake with blackberries had fewer blackberries than I would have liked, but the fact that there were fresh whole blackberries in this cake was in and of itself a nice surprise. The pound cake had a nice tangy lemon taste and the polenta gave it texture that set it apart from regular flour pound cakes. The blueberry oat bar is the dessert to order if you want something fruity that is not too sweet. I liked the texture of the bar, and the generous layer of blueberries. If you like oatmeal with blueberries, you will love this dessert. All their baked goods are about $3 and they offer everything from Quinoa bran muffins to Dark Ale Spiced Gingerbread, so you can be as adventurous as your palate demands. I was invited to try 31 Ten Lounge, so this is one of those rare posts where everything I ate and drank was provided by the management and delivered to me by the chef. More than 95% of what I write here is based on experiences where the owners, managers, and chefs do not know that I write a blog. On the rare occasions when that is not the case I will always let you know, and I promise that regardless of whether or not I paid for my meal and drinks, my comments will always be honest. 31 Ten Lounge becomes a club later at night, but if you go earlier than 10 pm, you can enjoy a few drinks and bar bites in their beautiful patio. 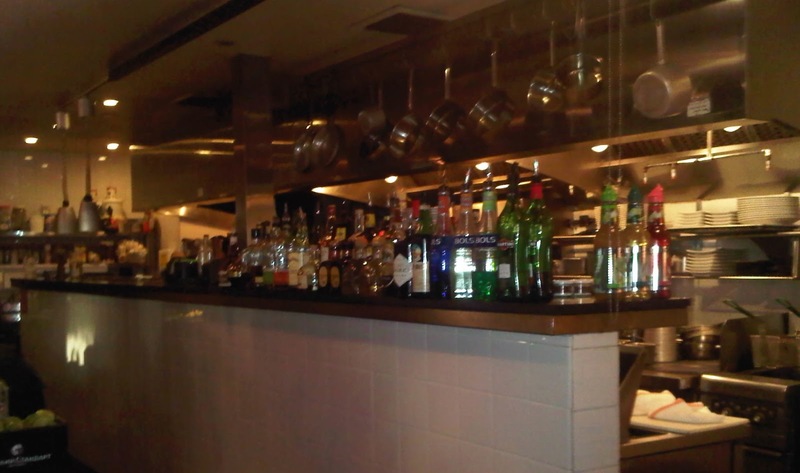 The open kitchen and bar. 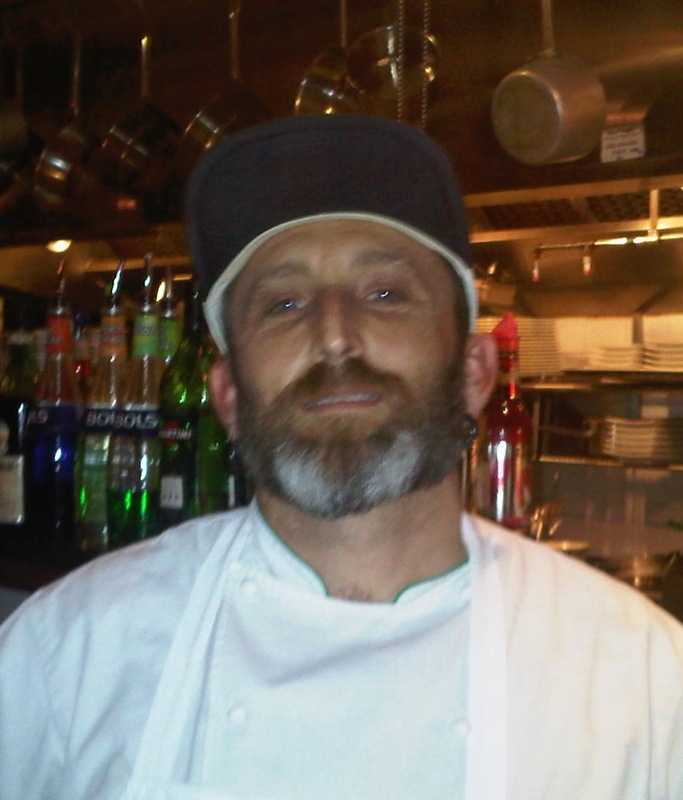 The creator of all the tasty bites, the chef, Michael Wilson. 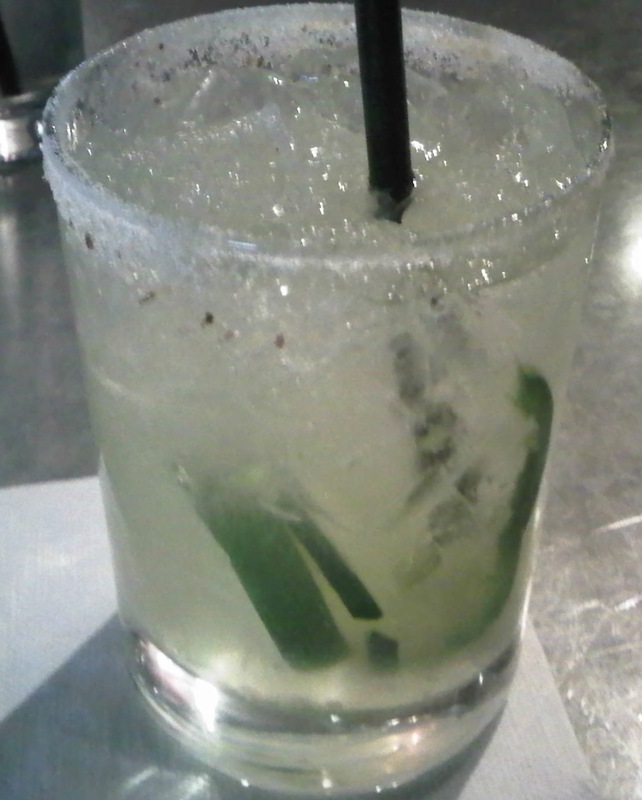 I asked the chef what he recommended to drink with the assortment of bites I would be tasting and he suggested the Diablo Margarita made with jalapenos, cucumber, and a nice blanco tequila. It was supposed to be spicy, but since they use fresh jalapenos, the heat varies and mine was not hot at all and overly sweet. When I told Joseph, the manager, he promptly replaced it and the second version was much better. Since I don’t like sweet drinks, I’m looking forward to their new martini menu debuting Thursday, April 18 with drinks like the Poison Ivy, made with Finlandia Grapefruit Vodka, Grand Marnier, Pomegranate Juice and a Rosemary infused Simple Syrup, and the Remedy, made with Jameson Irish Whisky, Honey &amp; Ginger Infused Simple Syrup &amp; Lemon Juice ($14-$16). 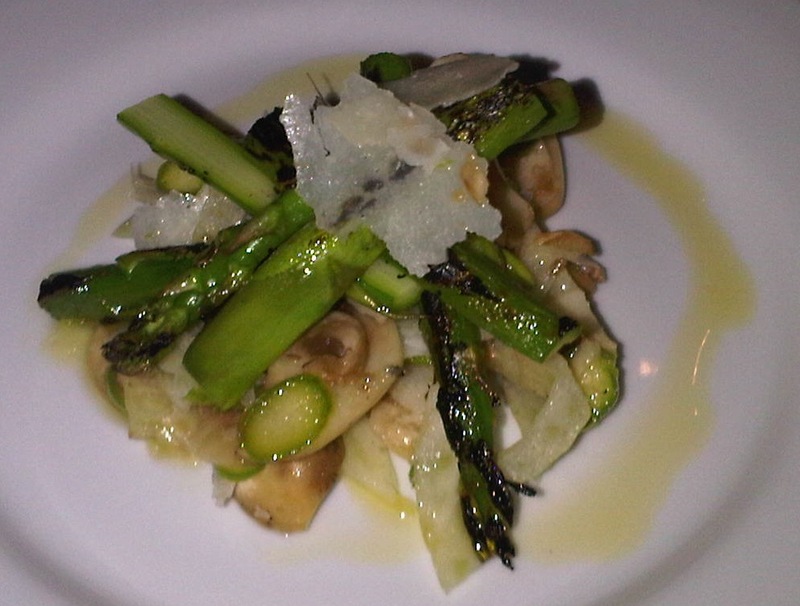 One of my favorite items was the grilled and raw asparagus with fennel, button mushrooms, and grana padana cheese for $13. The contrasting textures and tastes of raw and grilled worked well with just enough cheese to add a slightly salty richness. I would gladly order this as an appetizer again. One advantage to being invited is that I got to chat with the chef about his creations. 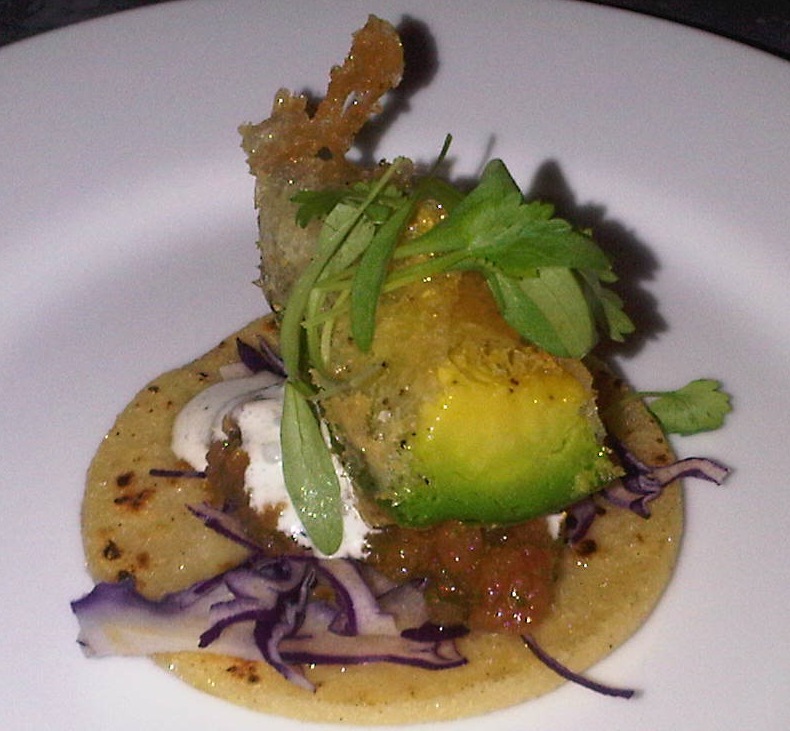 An intriguing menu item is the tempura avocado taco which is a perfect choice for vegetarians and all the Californians who love this local fruit. They make their own tortillas and the usual serving is two for $8, but since I was tasting, I asked the chef to make mini portions so I could taste more dishes. I loved the crisp batter and the soft texture of the avocado with the cabbage, salsa and sour cream, but I found the tortilla underwhelming. It may have been made in house but the texture was heavy and it was oily. They serve two kinds of ceviche ($13 each), so I got mini tastes of both the diver scallop and calamari (on the right) and the shrimp (on the left). I definitely preferred the diver scallop and calamari for its wonderfully light ocean flavor, but if you are not adventurous, you have a tamer choice available. If you go to sushi bars and order California Rolls, order the shrimp ceviche. 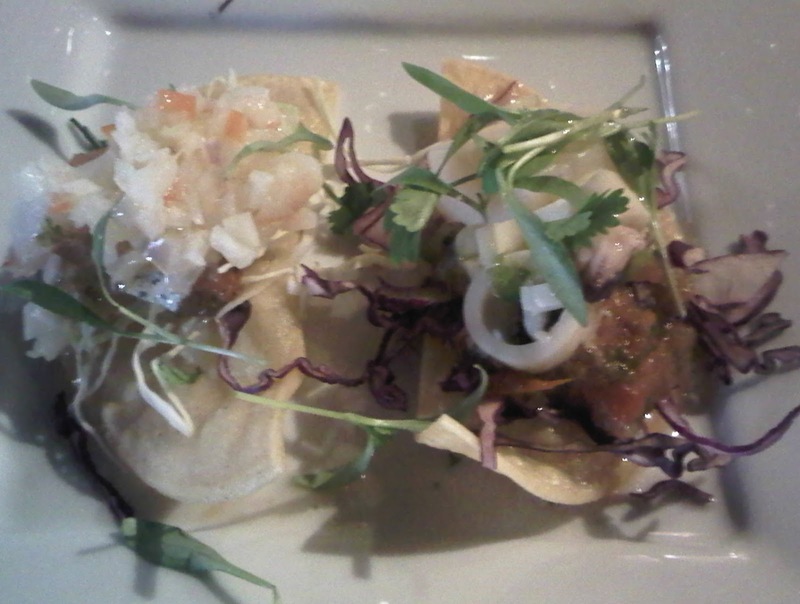 If you order sashimi, get the diver scallop and calamari ceviche. 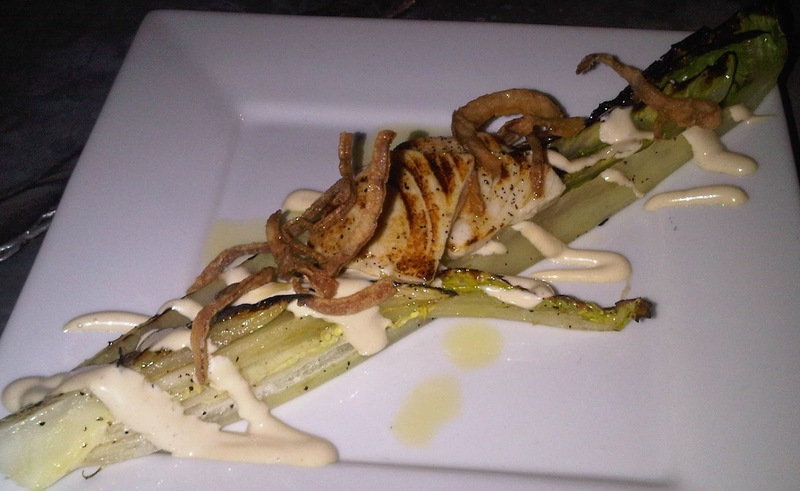 The grilled romaine with seared Hamachi in a yuzu Caesar dressing (regular portion size is $17) was another one of my favorite bites. The slightly tangy yuzu with the creamy Caesar married the grilled fish and warm romaine like a Unitarian preacher joining a Northern and Southern Irish couple together. 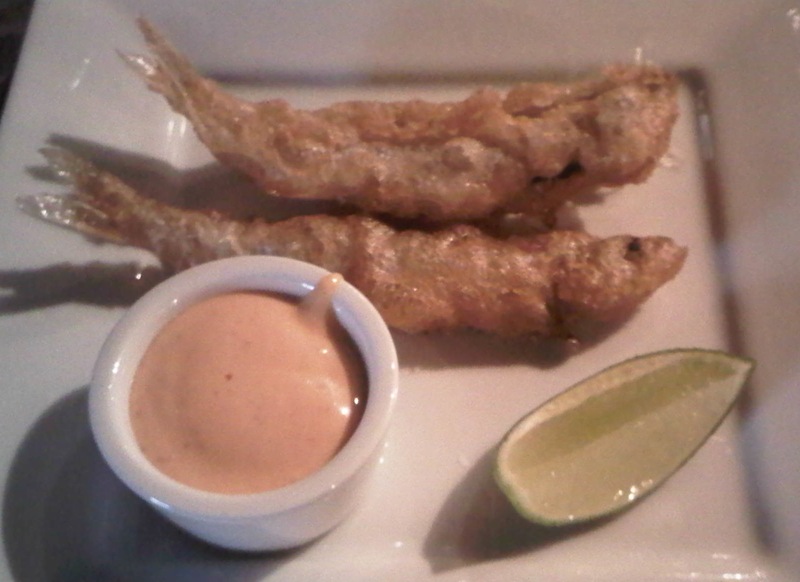 When I saw smelt fries on the menu, it was the first thing I wanted to try. Served with a sriracha mayo and lime, these tasty bites are great finger food for any fish lovers. If you want some creamy spice, dip them in the sriracha mayonnaise which adds just a bit of heat. A normal size portion is $13 and if it was available all year round I would always order it. I thought I was done with the fish and vegetable tastes when chef Michael brought out this seared diver scallop in a taleggio cheese sauce. I would never have put a cheese sauce with a seared scallop, but that is why chefs are truly artists at heart (as you can see from the plating, food can be art). The scallop was perfectly seared and not overly cooked (think of seared ahi tuna), not cooked through, not raw. I was undecided about whether the taleggio sauce worked with the scallop because I thought the richness of the cheese and scallop combination was a bit too much together, but I loved the scallop by itself. 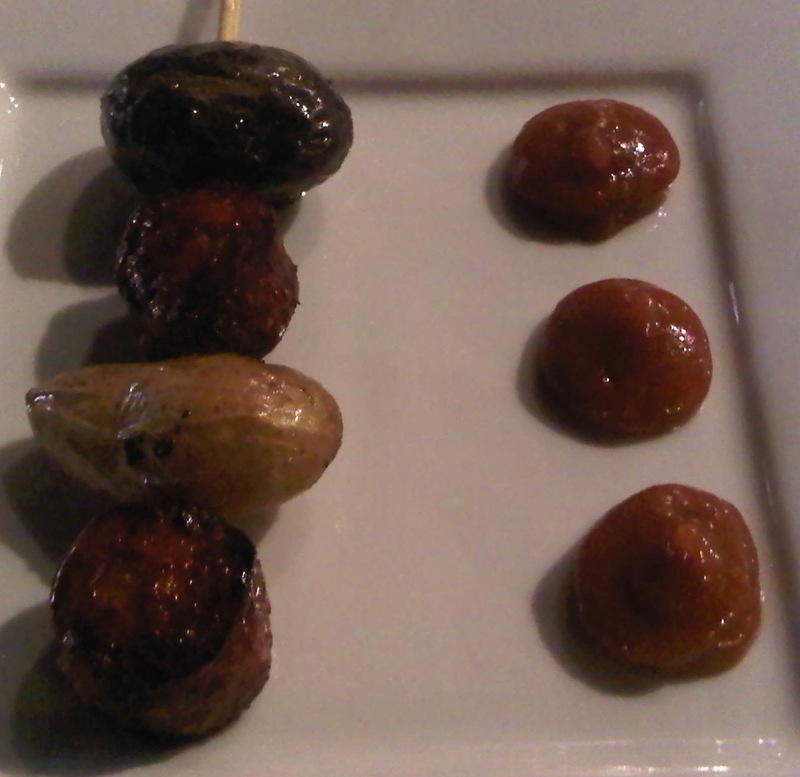 The chorizo Bilbao and fingerling potatoes was one of the chef’s recommendations and I LOVED the chorizo Bilbao! I gave the chef a card for Lindy &amp; Grundy so he could taste their handmade chorizo; maybe the chef will create a chorizo flight! 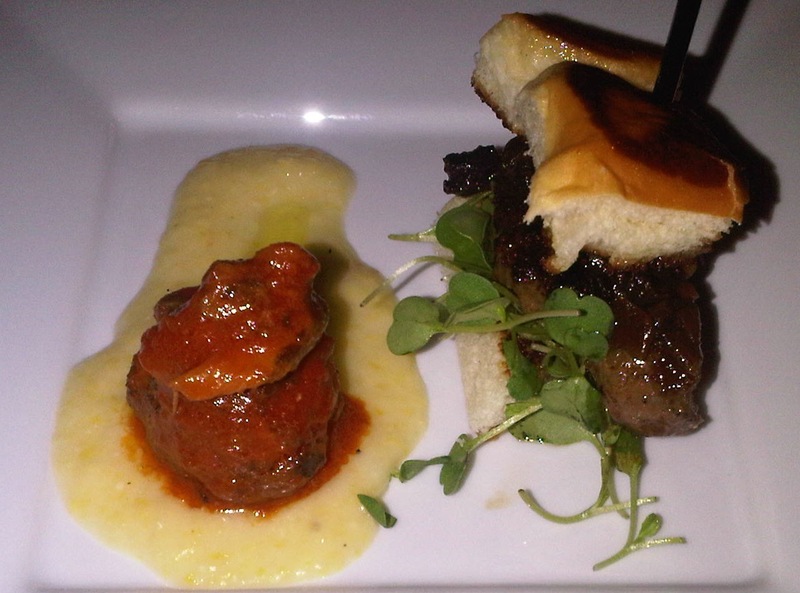 Since I couldn’t decide between the wild boar meatball with creamy cheesy polenta or the wild boar slider, the chef made me a mini plate of both 🙂 My favorite was the wild boar meatball (normal portion is $15) because the tomato sauce perked up my palate, but since they grind all their own meat, the texture in both offerings was perfect. If you have never tasted wild boar before I would recommend you try the slider, made with oven tomato, taleggio, and arugula for $7. 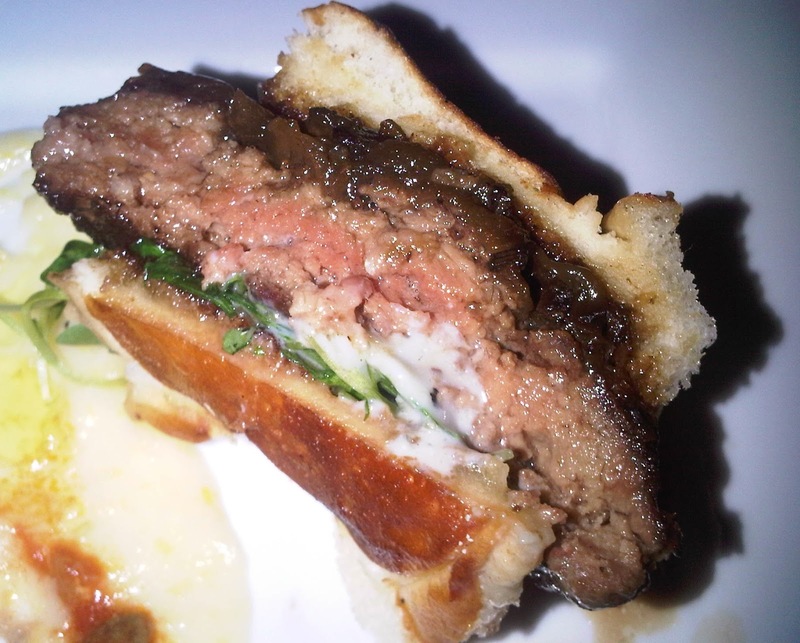 You will never want a boring beef slider again. Even though I am not a big dessert eater, I know many of you are, so I tried the molten chocolate cake with gold leaf and an orange blossom cream. As a non dessert eater, anytime I eat more than one bite of a dessert, it is a great sign. I ate nearly all of this (even after all the other bites I tasted)! The warm molten center of the cake was addictive, and because none of the components were overly sweet or rich, this was a satisfying way to end my meal and evening. 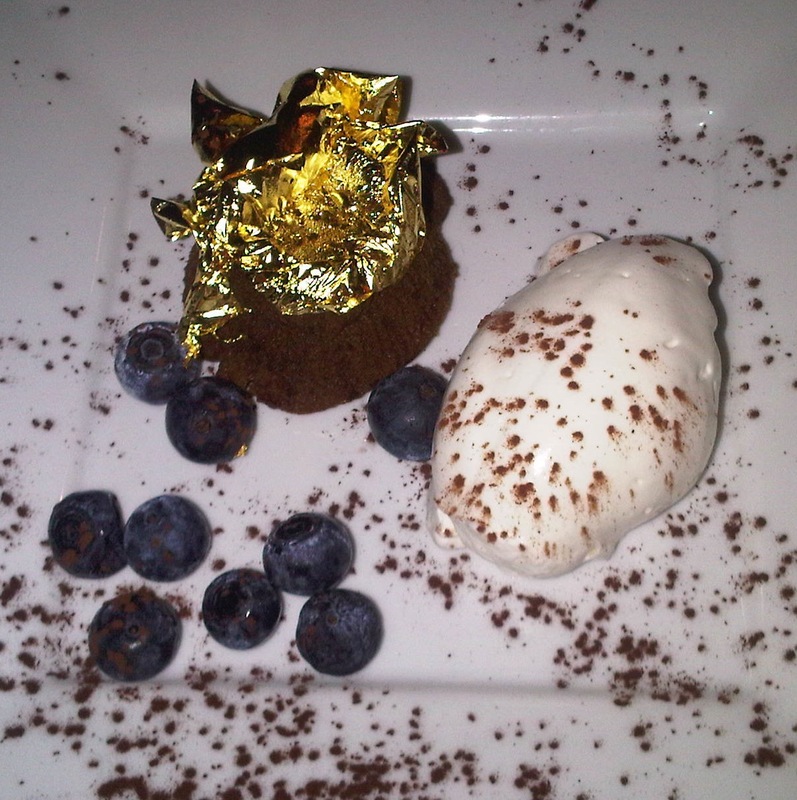 The edible gold was a beautiful touch and fresh berries with the fresh cream gave the dessert a lighter mouth feel. Life in Los Angeles can be very good with a bit of advice. Double or triple the estimated drive time given by your map/direction/gps application. Don’t drive too far during rush hour (1 mile may take 30 minutes by car at 5pm). Don’t drive at all when it rains because even if you know how to drive in the rain, most other people who live here do not. Yes, all my advice has to do with driving, because even though I will travel for food, there are limits to the amount of stress I will endure. I would gladly swap going through TSA at LAX rather than be stuck in a car on the 405 heading to the Valley at 5pm. Thankfully Lyfe (Love Your Food Everyday) just opened in Culver City, which means that I don’t have to drive to Stanford in Northern California to eat their lovely food. Lyfe focuses on sustainability, community, and being eco-friendly. Their version of “fast food” is healthy, varied, and embraces those who are gluten intolerant or vegetarian. Everyone I encountered at Lyfe did their best to be helpful from the moment I entered (or got into line to enter) the restaurant, explaining the availability of different menus (one for regular, one for gluten free, and one for vegetarian), and offering samples (the flatbread Margherita was superb). I ate in the first few times and received a GPS table tracker after placing my order. This handy device lets the food runners know EXACTLY where you are in the restaurant so you are assured to get your order as soon as it is ready. For to go orders, their utensils are biobased (made from potatoes). You may add either free range chicken, Gardein “chicken”, agave-lime tofu, grilled shrimp or grilled salmon to any salad for an additional $2-$4, so I added Gardein to the Farmer’s market salad ($8.99) of organic winter greens, blackberries, agave pickled onions, spiced pecans, and goat cheese in a balsamic vinaigrette. The menu listed calorie counts and sodium counts beside every item, so I knew my meal came in at 428 calories and 649 mg of sodium. I didn’t care about the counts as much as I cared about the flavor, so I was very happy to find that the low calorie count did not diminish the taste. The combination of fresh berries with the crunchy sweetness of the pecans, the creamy goat cheese, and the tartness of the vinaigrette worked very well together. I could eat this salad with a different protein combination all week. I also tried the Gardein crispy chicken sandwich for $8.99 which came with a small side salad of kale and carrots. The sandwich had some very nice components, like shishito pepper relish, organic tomato and romaine lettuce, red onions, and chipotle aioli on multigrain bread. The quality of ingredients and the creativity of this sandwich recipe makes this a good choice for anyone who wants a healthier (and tastier) chicken sandwich than most places offer. Seeing grilled Barramundi listed as one of their entree choices for only $12.99 surprised me in the best possible way. Barramundi is one of my favorite fishes and for those who like Sea Bass, it is a great alternative to the ubiquitous salmon found on nearly every menu. Served with edamame, napa cabbage, baby spinach, shittake mushrooms, and scallions in a spicy broth, you can choose the regular version with soba noodles, or the gluten free without (which is what I chose because I don’t like soba noodles). It was not very spicy at all, but I enjoyed the broth, vegetable, and fish combination very much. The grilled Barramundi was a bit over cooked, but dipping it in the broth alleviated the minor dryness. Yes, life and Lyfe are good in Southern California, especially when there are fresh and healthy choices in a pedestrian area close to home.